• The Power Tower provides a simple and efficient way to improve the overall health in the comfort of your own home, you just need minimal space. • Working out your upper and lower body from multiple angles allows you to place greater emphasis on the muscles you want to improve, and recruit more muscle fibers. Strengthen your back, arms, shoulders and Ab muscles and much more. • Perfect for adults or children to grow workout, fitness enthusiasts and the elderly exercise. Thickened carbon steel pipe to ensure max strength, professional installation of accessories can support up to 300 lbs. We promise every detail of the product to the best. You can also build up your back, arms and shoulders with pull-ups and chin-ups. Plus, engaging different muscle groups has never been easier - simply choose between the outside grips or the center. Sculpt your chest and shoulders with the push-up station. The raised station allows you to perform push-ups with a neutral wrist, decreasing the strain on the wrist joints. • The push-up station has padded hand grips so you can stay comfortable while you work out. • It will work on your triceps, chest, and shoulders for incredible upper-body strength. • Perfect for you to exercise and training. 【Can be Adjustable】Adjustable Height Pull Up Bar with Wide or Narrow Grip.Removable Sit Up Bench with Leg Straps & Upgraded Padding.Push Up Bars.Easy to use thanks to the self-assist support bar giving extra stability and confidence. 【Solid Design】Sturdy with a heavy-duty base and non-slip floor pads for stable and secure exercising. Strong iron construction for a compact yet solid frame with a maximum user weight of 100 kgs. Durable upholstery with padded support for arms and back for maximum comfort as you perform reps.
【Multi- Use】Wide range of low-impact workouts using your body weight across the multiple workout stations: Pull up Station, Push up Station, Dip Station and Ab Training. Perform dips, push ups, pull ups and wide pull ups, leg and vertical knee raises, trunk twists, reverse grip pull ups and more quality drills. 【Effectively Exercise Chest, Arm, Back, Shoulders & Ab Muscles】Multifunctional gym station for effective total upper body workouts to tone muscles and strengthen your core, arms, shoulders, chest, back and more. 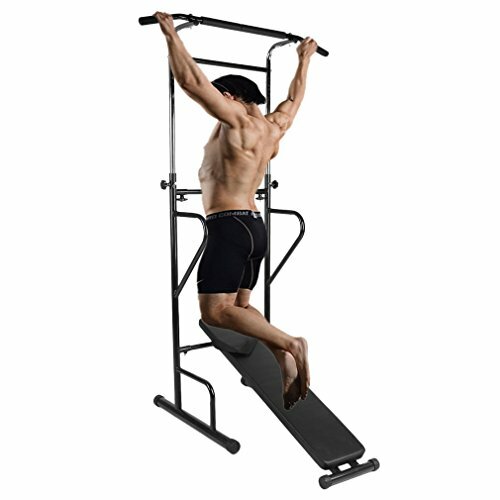 Designed for focussing on the upper body whilst engaging and working your whole body. Great addition to home gyms and for those wanting to build up strength at home.